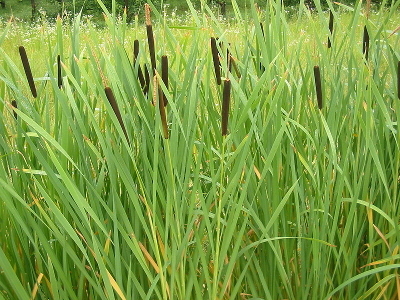 Cattails are an easy to find plant that is a friend of the forager, herbalist, bushcrafter/survivalist, and basket-maker. In this article, you will learn how to identify cattail (and tell it apart from it’s toxic look-alike! ), which parts are edible at what time of year, how to use the ‘fluff’ and other parts for survival purposes, PLUS step-by-step instructions on how to make a plaited cattail basket - an excellent bushcraft project for the winter months! Habitat: Wetlands, marshes, ponds, ditches, lakes. - Each plant contains male and female flowers. The male flowers at the top of the spike disintegrate after releasing pollen, and the tiny female flowers form a dark, dense sausage shape. Euell Gibbons, famed author of Stalking the Wild Asparagus, appropriately nicknamed it the “supermarket of the swamp” as there are edible parts year-round! 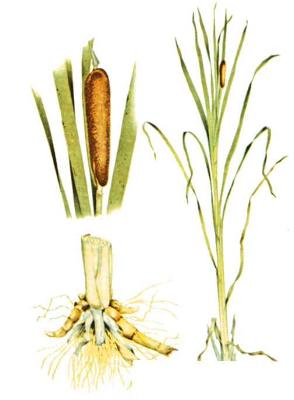 Corms (appear late summer, persist through winter and turn into shoots in spring): The small, horn shaped shoots of next year’s growth at the base of the stalk, above the rhizome. Clean, peel outer leaves to tender core and cook. 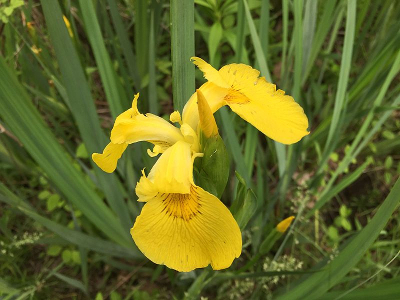 Young stalks (Spring): edible up to 2-3 feet tall. Break off from rhizome and cook, then peel outer leaves to white core. Rhizomes: (Highest starch levels occur in fall-early spring) 1) Whole: Dig out of the mud, CLEAN very well. 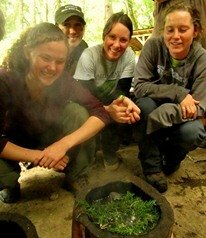 Cook over a fire until all water is cooked out and outside is charred. Peel away outside and gnaw on starchy interior. 2) Flour: Cut into pieces and soak in water, allowing starch to settle at bottom of a bowl. Drain water, allow starch to dry. Makes a great addition to ash cakes or pemmican. Green flower heads (before pollen, late spring): Can be cooked and eaten like corn on the cob. Pollen: (summer) Harvest pollen by gently bending stalk and placing a bag around the male flowering part and shake. Do not break stalk, or female flower will not be able to grow. Pollen can be used as a flour supplement, added to soups to thicken, or added to any food to add nutrition and protein. 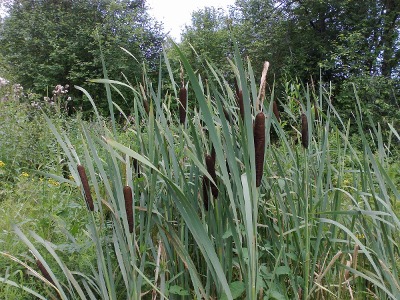 Please note: Cattails can absorb toxins from polluted waters. Do not harvest in areas with heavy traffic, runoff, or other pollution. Rhizomes MUST be washed and cooked thoroughly to avoid contracting water-borne illnesses like giardia. - Viscous substance between leaves near base of the stalk is a topical analgesic for burns and an antiseptic for minor wounds and insect bites. - Root poultice soothing for burns, poison ivy, infections and ulcers. - Tinder, but is best paired with another tinder such as fluffed cedar bark, dried cottonwood cambium, or dried leaves, as it tends to smolder better than catch on fire quickly. - Insulation: Pack in between 2 sewn-together blankets to make a primitive sleeping bag, or simply stuff between a base layer and a sweater (along with leaves and debris) to provide extra warmth in a cold-weather survival situation. - A torch: Soak in tallow (rendered animal fat) for a torch that can last as long as 6 hours. 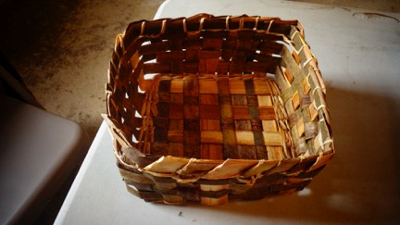 - Making baskets, which are beautiful are can be vital in a survival situation. - Making sleeping pads to stay warm at night. - Making sitting pads for keeping off the wet ground. - Weaving doors for shelters to keep out the wind. - Making cordage! A MUST KNOW skill for any survivalist. Stalks can be used as a handdrill spindle for making fire from friction. 1) Harvest leaves no later than mid-fall (late summer/early fall is easier). Wade into a marsh and cut leaves at base, leaving rhizomes intact for next year. Harvest ethically, they are an important food and shelter source for many creatures! 2) Lay the leaves out to dry. When completely dry, hang up indoors to avoid mold. This step allows the plants to shrink before basket construction so the basket can stay tight instead of shrinking and having holes. 3) Soak the leaves in warm water for 30 minutes or cold water no longer than overnight. Soak until plants are pliable and will bend without cracking/breaking. 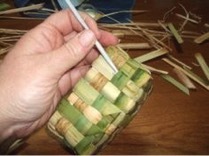 6) Weave the leaves in an over/under fashion to form the base of the basket. The weave should be as tight as possible, wiggle the pieces so there are no holes. These are called the warps. 7) Once the base of basket is the same size as your form, begin twining with raffia. Take 1 piece of raffia, and wrap it over one warp so the center is on the cattail and the two sides are hanging down in front and in back. -Twist the raffia so the piece in front goes to the back and the piece in back comes to the front. - Repeat around every warp, then around the basket a total of 2-3 times. 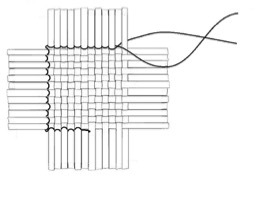 8) Ensuring your warps are still damp enough to bend without cracking, set your form on your basket base and gently bring your warps up vertically against the form. Rubber band or tie them at the top. 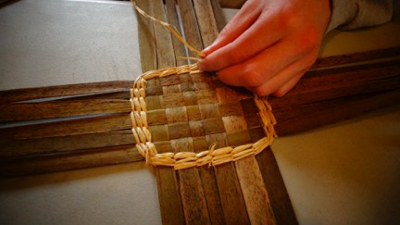 9) With a new piece of cattail (called the weft) begin weaving over and under each warp. - When you reach the place you began, trim the tail and tuck it in to where you started. - Use a pencil/stick to gently push each row of weft tightly against the previous rows. a) Once the basket has reached the desired height, unband the warps and trim them to ~2” long. 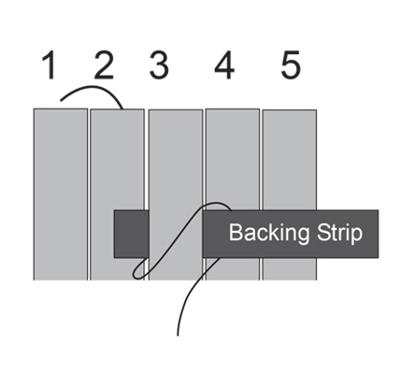 Insert a backing strip behind one warp. 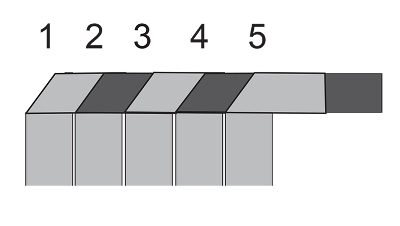 c) Fold strip 3 down at an angle so it lays flat against the backing strip. 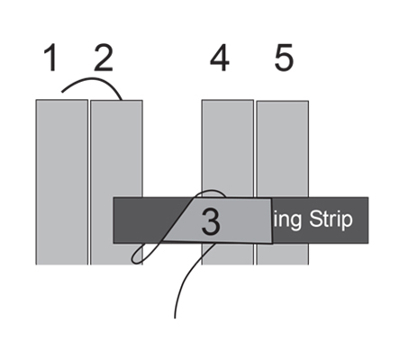 d) Bring strip 4 in FRONT of the backing strip and the folded strip 3.
f) Fold strip 4 down at an angle so it lies against the backing strip, just as in step 10c. g) Continue in this manner around the edge of the entire basket. 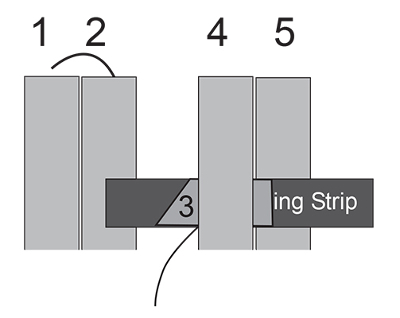 h) When you reach the starting point, trim the end and tuck it into the first folded strip. Pull raffia tight and tuck down into basket. And now you get to celebrate your beautiful basket! Feel free to send in photos of your cattail harvests or baskets, we’d love to see them! 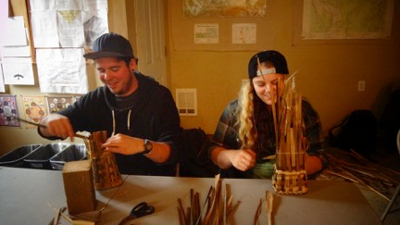 Plaited cattail basketry and many other ethnobotany & wilderness skills are taught as part of the Alderleaf Wilderness Certification Program. 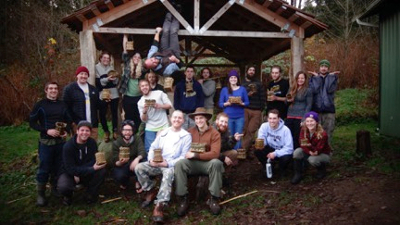 About the Author: Leah Houghton is an experienced outdoor educator. She wrote articles while teaching at Alderleaf. Learn more about Leah Houghton.